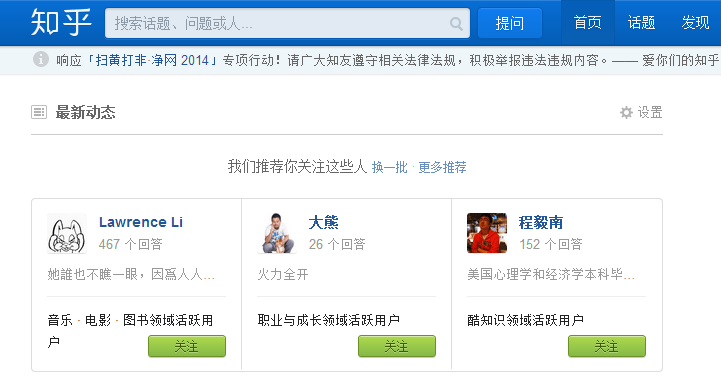 Zhihu, Chinese Quora-like question-and-answer-style knowledge base, secured $22 million of Series B funding led by SAIF. The company has received Series A financing from Qiming Ventures and angel investment from Innovation Works. Like its U.S. predecessor, Zhihu, which means “Do you know?” in old Chinese, lets users to ask or answer any question and tries to find the best answers to these questions by leveraging a voting mechanism. Launched in Dec. 2010, Zhihu started with a group of technical and relatively entrepreneurial minded users based on an invitation-only and authentication model. Zhihu is available for open registration since 2013 to attract larger user base and their topics have diversified substantially to cover popular topics like movies, culture, IT, education, etc. As of the end of May, the company claimed more than 6 million registered users and answers to over 2 million questions on 150k topics. The website’s average daily unique visitors stand at 2.5 million and average daily PV is around 6 million, the company announced. Zhihu claimed more than 6 million downloads on aggregate for its mobile apps on iOS and Android platforms. Despite all the similarities and differences between Quora and Zhihu in terms of product features, Zhihu puts more emphasis on delivering information like a media, while Quora focuses more on discussion. Zhihu periodically publishes print and electronic books for knowledge on selected topics. Moreover, the service also host Zhihu Round Table: an offline activity in which multiple experts are invited to write answers to certain questions. The U.S. Q&A website Quora just raised $80 million of Series C funding at a valuation of $900 million early April.